Beauty & All That: Quarterly.co Subscription Box with MizzFit aka Bianca Jade! 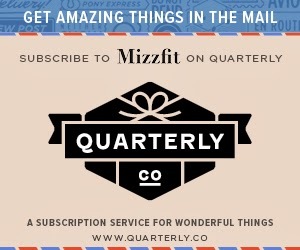 Quarterly.co Subscription Box with MizzFit aka Bianca Jade! In my quest to find a GOOD subscription box to check out, I came across Quarterly.co which features many contributor's boxes, with various themes and surprises. I was looking for a non-makeup and non-food box as I have already sought these out and just wanted something different! When I saw a fitness fashion box, curated by MizzFit, I knew I had to get my hands on it! These quarterly boxes (really wish they were monthly as I can't wait 3 months!!) curated by https://quarterly.co/products/mizzfit will have anything and everything that is a part of her philosophy Styling Up 2 Shape Up. Her first box is themed, "Pack your Gym Bag" which sounds amazing! I'm also excited about her second box, "Get inspired to sweat" which sounds like it will include her favorite workouts!